Now that the night is settling in a little bit earlier (feels like a LOT earlier) with the shedding of daylight savings time, my son and I are cozying up a bit longer with books before bedtime. Reading together is among our favorite rituals, neck and neck with ice cream sandwiches at the park and spider hunts. Long before my son was even born I was busy establishing a Future Offspring Library with classic children’s books – Curious George, Amelia Bedelia, The Snowy Day, Where the Wild Things Are, Green Eggs & Ham, The Little Prince, The Tale of Peter Rabbit – and many fantastic more current day offerings such as The Elephant & Piggie books and Skippyjon Jones. Growing up, I was a regular fixture at my town and school libraries devouring books and my son and I now take weekly trips to our neighborhood library to add variety to our story hours. Recently we discovered a beautiful book of poetry, Red Sings from Treetops, which is surprisingly sophisticated in its fresh, song-like reveal of colors in every season. 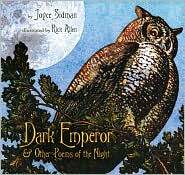 To our delight, the author, Joyce Sidman, has recently published another book of poems for children perfect for the imminent eventide of winter – Dark Emperor & Other Poems of the Night. An illumination of the goings-on in nature while we humans sleep, this collection of nocturnal vignettes invites exploration of moonlit world nuances with fascinating print illustrations created by artist Rick Allen. And so now with jammies on, bellies full and owls giving flight, lamenting the loss of daylight no more, we shout: bring on the night!